After serving in pastoral ministry for nearly twenty-five years, I can testify that the most discouraging moments occurred when the people of God failed to look favorably on theology. R.C. Sproul rightly laments, “We live in the most anti-intellectual period in all of church history.” Frankly, many pastors have the battle scars to prove it. I know I do. Kevin VanHoozer and Owen Strachan serve up a timely antidote to this troubling, anti-theology age we find ourselves in. The Pastor as Public Theologian presents a fresh vision; a vision for “reclaiming the vocation of the pastor-theologian.” But the authors have a larger vision that unfolds throughout the book. Their vision extends to local congregations. They too need to reclaim the vision and vocation of the pastor theologian. Part one explores biblical theology and historical theology. Part two explores systematic theology and practical theology. Each chapter is drenched in biblical wisdom with an eye on kingdom priorities. This book stands in the same stream as David Well’s excellent works, No Place For Truth, God in the Wasteland, and The Courage to Be Protestant – to name a few. The great strengths lie not only in setting forth a description of the problems in the church but in the prescription for moving forward. Such a move entails pastors who are theologically motivated and theologically driven. These pastors offer up theologically rich sermons which equip, edify, and send the people of God to the nations. 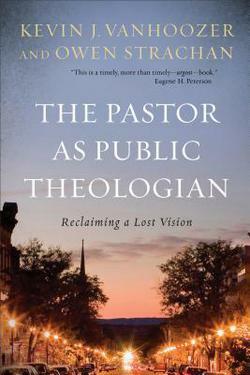 The Pastor as Public Theologian is a sweeping book. It is, in many ways an epic accomplishment. Indeed, VanHoozer and Strachan achieve their goal in setting forth the biblical case for recovering the biblical portrait of the pastor-theologian.